IIED researchers will be speaking at the international ministerial conference of the Partnership for Action on Green Economy (PAGE) from 27-28 March, discussing how best to support countries making the transition to inclusive and sustainable economies. The 2017 PAGE Ministerial conference will take place in Berlin, Germany, on 27-28 March. The event will bring together more than 300 ministers, heads of United Nations' agencies, thought leaders and representatives from civil society, business and media to discuss how to accelerate the shift to green investment and inclusive growth. IIED director Andrew Norton and colleagues will be participating in a number of sessions at the conference, and IIED will also be exhibiting in the parallel exhibition. The Partnership for Action on Green Economy (PAGE) was launched in 2013 by five UN agencies. The partnership supports countries wishing to reframe their economic policies around sustainability. PAGE works closely with national governments, offering technical advice and capacity building services, and promoting synergies between governments, the private sector and civil society organisations. The Berlin conference will explore how economies and financial markets can be "enablers" for the Sustainable Development Goals (SDGs) and the Paris Agreement. IIED director Andrew Norton will co-moderate the closing panel on day one of the conference. Norton recently wrote about the challenges of achieving the transformations necessary for a sustainable and equitable development pathway. He and Melinda Crane of Deutsche Welle TV will co-moderate a discussion on how to bring the insights gained at the PAGE conference back to country leaders for policy consideration. This panel includes high-level speakers from a number of countries: Catherine McKenna, Environment Minister of Canada; Karolina Skog, Minister for the Environment of Sweden; Bambang Brodjonegoro, Minister of National Development Planning of Indonesia; Cho Kyeung Kyu, Minister of Environment of Republic of Korea; Pedro Taques, Governor of Mato Grosso, State of Brazil; Ambassador Macharia Kamau, Permanent Representative of Kenya to the United Nations; and Frank Rijsbermann, director general of the Global Green Growth Institute. IIED chief economist Paul Steele will speak at this session, which will look at how to use fiscal policies to mobilise resources to finance the SDGs and the Paris Agreement. Steele's contribution will focus on the question of how to create political coalitions in favour of environmental fiscal reforms. The session, which will be chaired by Lars Andreas Lunde, State Secretary of Norway's Ministry of Climate and Environment, will also examine how to achieve efficient and equitable allocation of public and private finance for delivering the SDGs and the Paris Agreement. Green Economy Coalition convenor Oliver Greenfield will participate in this discussion. The Green Economy Coalition (GEC) is a global network of organisations, including IIED, committed to accelerating a transition to a new green inclusive economy. The GEC, IIED and partners hosted a conference in February 2016 aimed at building a new policy agenda to integrate the informal economy with inclusive green growth and sustainable development. The GEC is an official partner of PAGE and the ministerial conference. Other speakers include Francesco La Camera, director general for Sustainable Development, Energy and Climate at the Ministry of Environment of Italy and Mao Amis, founding director of African Centre for a Green Economy. IIED and GEC will be hosting stands at the Green Economy Pioneers Exhibition, which runs in parallel to the conference. The exhibition is a networking space featuring stalls that showcase the practical initiatives, solutions and innovations that are already in action. 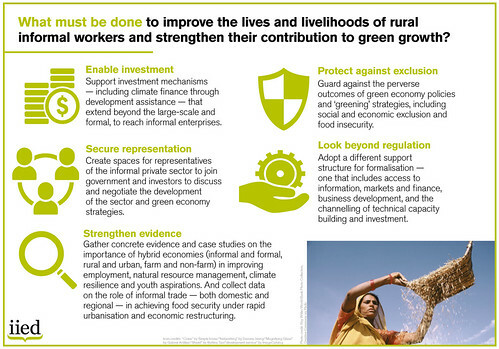 Among IIED's exhibition are three posters focusing on inclusive green growth agendas and the informal economy, a different policy approach for informal workers in urban areas, and what must be done to improve the lives of rural informal workers. These can be viewed below or on IIED's Flickr site, where the posters can also be expanded. In many developing countries the informal economy makes up 85 per cent of the economy – it is where the poorest find work, housing, food and markets. For green growth to be inclusive then it must work alongside and in partnership with the informal economy. This stand will explore the linkages between the green economy and the informal economy and showcase positive stories whereby policymakers have partnered with informal workers and communities in order to drive sustainability. This exibition stand will focus on the potential role of the informal sector in the transition to green economies. Most of the world's poorest and most vulnerable people live and work in the informal economy – but most green growth plans don't mention informality. IIED's work frequently focuses on markets and sectors with high levels of informality and artisanal enterprise. IIED's Shaping Sustainable Markets research group is working to improve the governance of these sectors. The current edition of IIED's flagship journal Environment and Urbanization focuses on informal employment in urban contexts. It was guest edited by the network Women in Informal Employment: Globalizing and Organizing (WIEGO). An associated briefing paper looks at how the urban informal economy can be integrated into global standards for sustainable urban development. This stand will examine the key principles that would underpin a transition to a green economy. As green economy plans and initiatives begin to proliferate, what are some of the core principles that might underpin a transition? In the lead up to Rio+20, more than 300 civil society organisations drafted some key principles. Are these still valid? What’s missing? What needs changing? Participants will be invited to vote and give their opinion in an ongoing discussion on the principles for a green economy. Every green economy must be rooted in local and national contexts, but there are some phases that all countries will likely go through in order accelerate the transition. This stand will highlight some of the different phases of a national green economy transition – from inception to mainstream adoption. It will highlight the roles of policy leadership and societal demand in securing inclusive national green economies, and showcase a diversity of different transition pathways. There is no one blueprint for a green economy. Every national transition will need to respond to local needs and national contexts, and will require a continuous loop of learning, knowledge sharing and innovative communications. This stand will focus on learning and communications platforms, and the role that inclusive research, policy creation and human stories plays in driving the transition.